Letting your guests practice their hand at mixology is a fun way to keep the drinks flowing at your holiday party. It also saves you from getting chained to the bar, unable to perform your other hosting duties or, you know, actually have a cocktail for yourself. And if there’s one rule I always keep at my parties, it’s that the busiest person (aka me) should always have a drink in hand. These tips make setting up a DIY holiday-themed cocktail bar easier than you might think and help you host a party where you and your guests get to have fun. Sounds like a win-win, right? A little decoration goes a long way. Try decorating your bar with a string of LED fairy lights, a sprig of holly or a smattering of small holiday ornaments that don’t clutter up your space too much. The key is to add a few pops of holiday cheer among your bottles. These DIY wine bottle knit hats and scarves are a fun way to decorate your bar without making your space unworkable, and these festive bottle stoppers zhoosh your bar too. You should stock your holiday bar with all the usual suspects — vodka, gin, whiskey, rum — but it’s the add-on ingredients that will make things extra special. Consider eggnog and apple cider as mixers along with your standard tonic water, club soda, cranberry juice, etc. Add a bottle of peppermint schnapps, butterscotch schnapps, cinnamon whiskey and chocolate liqueur to complete your holiday bar. Print out or write on index cards some holiday-themed cocktail recipes your guests can use as a guide in case they feel overwhelmed at the prospect of mixing up their own festive drinks. The last thing you want is for someone to create a cranberry-gin-cinnamon whiskey-butterscotch schnapps surprise and need to be carried to the bathroom later. Some people just won’t be into making their own cocktail, and that’s OK. But let them in on the holiday fun by making one big-batch cocktail ahead of time. This will also help alleviate any crowding at the bar — if too many people are in the middle of making a new cocktail, guests can just opt for a glass of your big-batch drink instead. Wouldn’t you know it? We happen to have a bunch of big-batch cocktail recipes. Garnish can make all the difference. 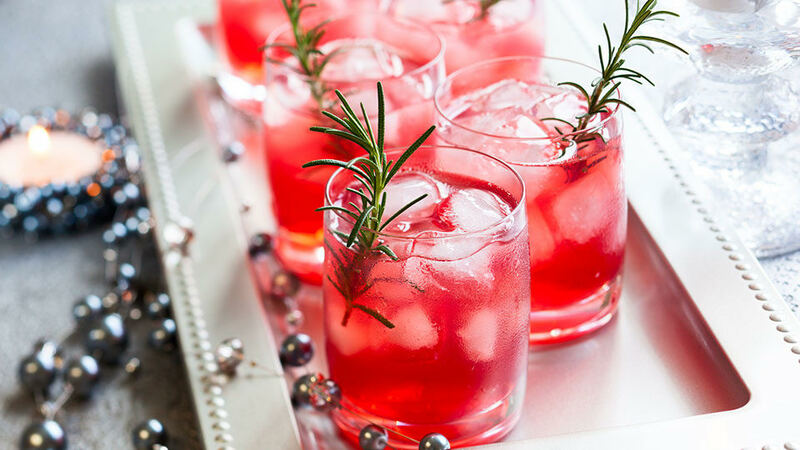 Use peppermint sticks and rock candy as drink stirrers, add a bowl of sugared cranberries with clove-studded orange rounds, cinnamon sticks, Luxardo cherries and sprigs of rosemary. Fill a shallow dish with crushed candy canes or cocoa powder and sugar to rim glasses. Paying attention to these little details results in a cheery payoff, so dress up your bar for the holidays and get ready to throw the holiday party of the year.